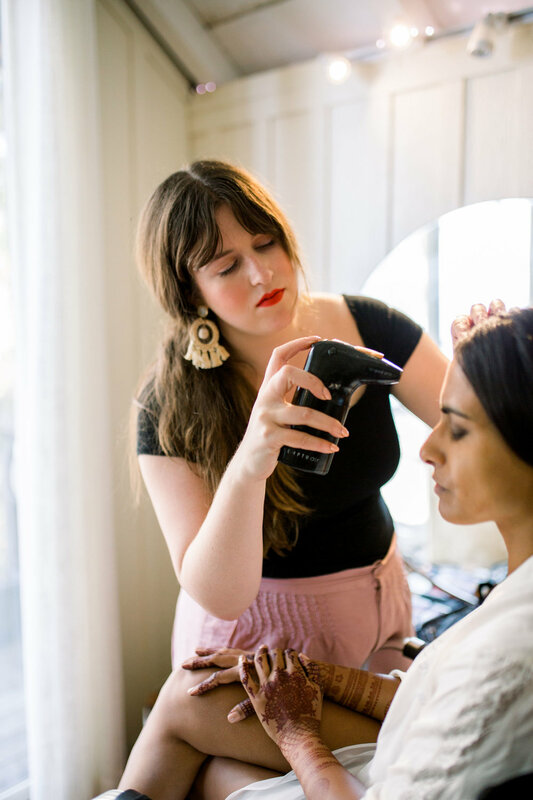 Back in August, we headed down to Monterey, CA to prepare doing hair and makeup for our bride, Uma, and her bridesmaids for her Big Sur Wedding. April and I were super excited to be apart of this, as it would be our first Indian wedding together, followed by a traditional American Ceremony. We loved the blending of cultures, and all the beauty that ensued. The weather couldn’t have been more perfect, and the Point 16 wedding venue was absolutely stunning! We are sure you understand how our jaws hit the floor when we saw this beautiful ceremony setup. April and I had started hairstyling and and makeup for 2 of the bridesmaids in Monterey. When we were able to head to the venue, we packed up and drove the 1.5 hour drive to Big Sur down the windy highway 1. We were officially off the grid, and loved every second of the random French Yodeling radio station we found (options were limited). We arrived at Point 16 and completed hair and makeup for the bride, Uma, and her four bridesmaids. I used my trusty Temptu airbrush makeup on everyone. With a start time of 6am for some bridesmaids, it’s even more crucial to use something I know will last all day. With Temptu’s 24hr wear, waterproof, transferproof hydralock foundation, I knew I would set myself up for success. Desiree using her handheld Temptu airbrush gun, on bride, Uma. My next miracle makeup product was my Hourglass Setting Veil, a translucent setting powder, which really kept everything in place all day, and also prevented any eye-makeup from transferring to the skin. Extra precaution for setting under-eyes. 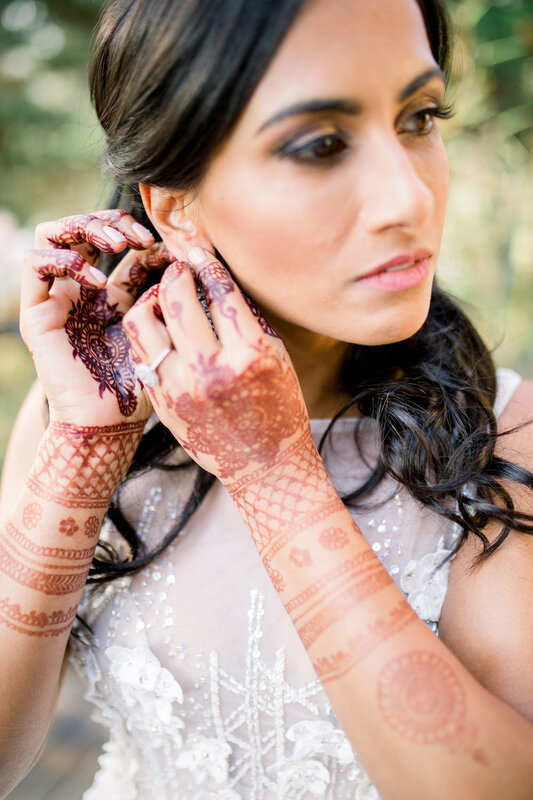 Whether your skin is oily, or getting teary-eyed during the ceremony, I got you covered! April’s go-to products of the day were from Living Proof. She relies on her Living Proof Flex Hairspray to keep hair in place all day without feeling stiff. Uma went with a chic up-do with a middle part for the Indian ceremony, which would be perfect for her gold tikka. April would later change this to a beautiful half-up half-down hairstyle for her American ceremony, where her and Martin would exchange their vows. April, getting every piece just perfect! 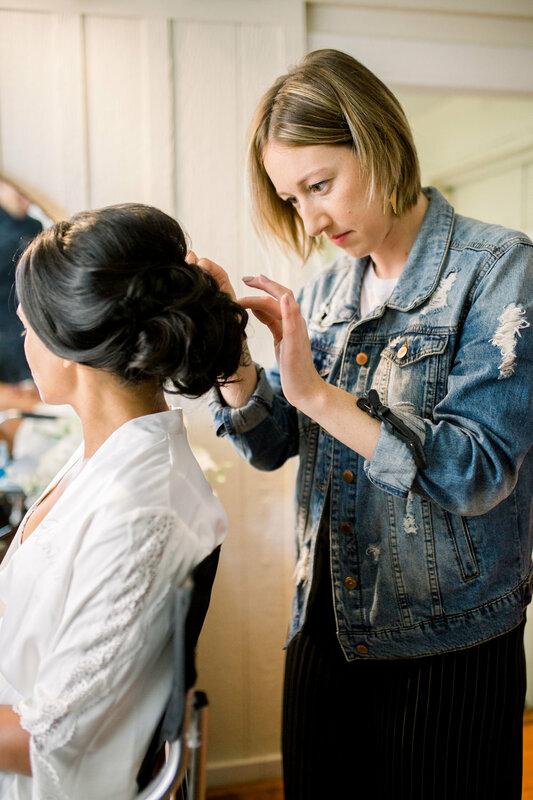 We love this beautiful bridal updo. 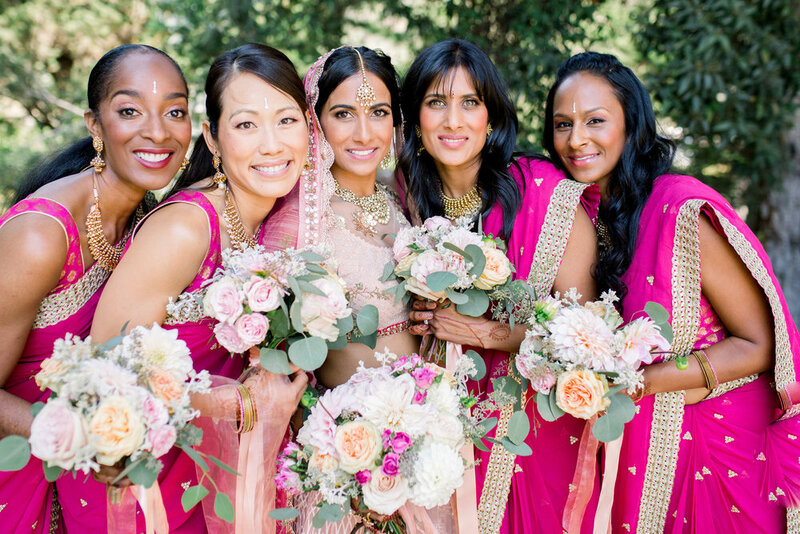 We were a big fan of the soft-glam look that Uma and the bridesmaids went for. They all looked gorgeous! Their hot pink sarees were stunning, and totally complimented Uma’s blush wedding gown, and hot pink Dupatta, or head scarf. We are obsessed with the bright colors! Uma and her bridesmaids look stunning. Uma and her husband, Martin, look like they are straight out of a fairytale. How cute are they?! Check the below slides for more photos of the Indian portion of the ceremony. Uma’s second look was just as stunning, in a gorgeous a-line gown with the perfect amount of sparkle. April switched Uma’s hair into a half-up half-down hairstyle, with pretty hair pins in the back. I made Uma’s eyes slightly more dramatic, adding a darker smokey eye. Uma and Martin exchanged vows overlooking the Pacific Ocean at Point 16. We love her final look! Cheers to Uma + Martin! Thank you for having us be a part of such a magical wedding day. Thanks to De Joy Photography for capturing such stunning images. We can’t wait to go back down to Big Sur! 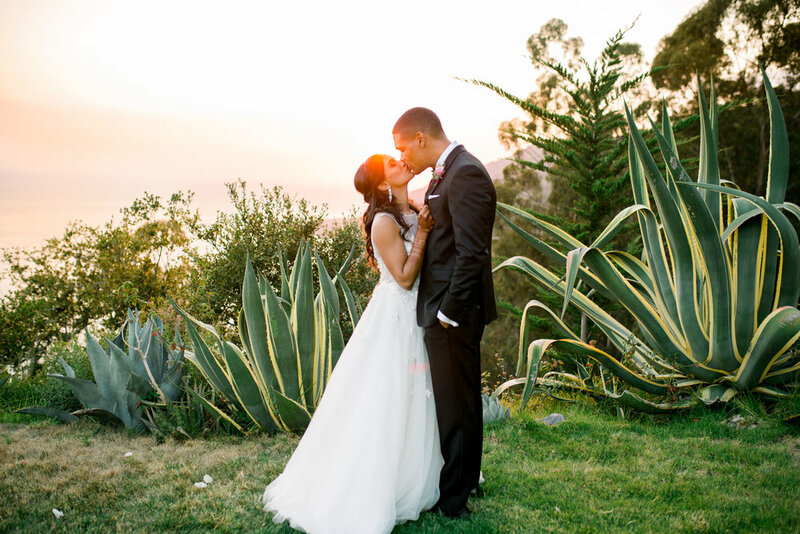 Book D + A Bridal for your Big Sur Wedding!